I got this link via the Nine Bullets blog, a download of an album from these southern rockers. A gargantuan sound with just the fire and fervour I like, lots of twang, a bit of Drive By Truckers and a hell of a lot of attitude. You can download it here and decide what you want to pay for it. A little slice of local history slipped out late last year in the form of a CD called Park Lane Archives. This was a collection of songs and demos recorded at park Lane studios in Glasgow’s south side in the eighties. Notable for being where Texas, Altered Images, the Bluebells and Del Amitri did some of their early recordings, of more interest were those bands who did not achieve stardom but faded into obscurity. 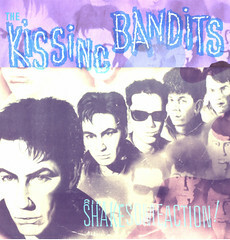 My interest was piqued by the inclusion of a song from The Kissing Bandits, a band I followed avidly back then. With a live sound that owed much to the garage punk classics of the sixties they wrote some fine songs and played some great gigs including the night that The Fleshtones wowed Nightmoves. They released a few singles and an album (on the French New Rose label) but sadly faded away. Singer Ronnie Costley now resides in Ireland and continues to perform, bassist Brendan Moon moved into promotion and is currently involved with Paulo Nutini. Spurred by the Park Lane disc I dug out their old singles to give them a spin and here for your listening pleasure is their version of The Flamin’ Groovies’ Shake Some Action. For some more info on the Bandits have a look here. It seems that nowadays a fair proportion of albums that arrive for review are Canadian in origin. Canadiana anyone? To be sure many of the touchstones in the alt country/Americana scene were Canadians, Neil Young, Joni Mitchell, The Band, to name a few. More recently Blue Rodeo and Blacky and the Rodeo Kings would be the names most likely to pop up in conversation. Well, here’s another band to talk about instead of the Mounties and Northern Exposure. Sleepy Driver are a band with a sound that is in the same vein as some of the eighties so called Paisley Underground crew. In particular there are moments that are very akin to the great Steve Wynn both in his Dream Syndicate days and more latterly from his “desert trilogy”. With a big guitar sound, great dynamics and at times a great pop thrust, leader Peter Hicks hits on the darker side of life including a great murder ballad (Drowning In My Dreams). While able to utilise an acoustic base in songs such as “Where You Are” and “North Dakota” (where some pedal steel leavens the sound) it’s the surge of guitar and organ on “When the Lights Come On” and the chunky slice of a song that is “Architects” that standout. Opening song “Like a Weapon” should be a radio hit at least if there’s any justice. Best of all is “Watch You Sleep” which has a fantastic, trippy guitar outro which is reminiscent of the Rain Parade. Matt Keating is new to me but this CD hit the carpet along with news that Mr. Keating is playing two local gigs in May (Laurie’s Bar and Kilbarchan if you ask). So what else to do but give it a spin and see what happens. Keating certainly comes highly recommended when you check his bio. Essentially he’s a singer songwriter who gets mentioned in the same breath as Elliot Smith and Ron Sexsmith, praise indeed. Normally one reads these blurbs with a sense of detached amusement as according to the majority of them you are about to hear the aural equivalent of the great American novel. I don’t think Keating is in the same league as Smith but he certainly gives Sexsmith a run for his money. This is his eighth album and is generally a very nice, very laid back affair. Warm and comfortable, late night listening with Keating’s vocals sounding so easy, at times reminiscent of Willie Nelson, at others, Lou Reed. This is indeed mentioned in his press and surprisingly enough it’s true. At times this makes for an odd listening experience but the end result is a heart-warmingly vulnerable voice, no more so than on “The Place” which is a beautiful song, like looking at snow through a window. Elswhere Keating’s songs remind me of Hobotalk. There is an aching at the heart of them which is bolstered by the inclusion of strings giving a song like “Better than That” a timeless quality, it could easily be from an early Neil Young album. On the strength of this a night at one of the gigs looks like an interesting proposition. New Heathens. Hello Disaster. Avenue A Records. Roots rock doesn’t get any rootsier than some of the stuff on this second album from New York band The New Heathens. Their debut “Heathens Like Me” sizzled and burned with an energy borrowed from the likes of The Stones, The Faces and Graham Parker. On this outing they have moved to a more classic Americana rock vein, due in part perhaps to having Eric “Roscoe” Ambel in the producer’s seat. All in all this is a great little album, a step up from their first and a joy to listen to. Coming after the suicide of Vic Chesnutt news today of the death of Sparklehorse’s Mark Linkous is a great blow. Heaven help anyone who gets into such a dark place that death seems to be the only way out. Nothing really to say other than to send out thoughts to his family, friends and fans. Grant Langston’s Stand Up Man places him firmly in the Bakersfield tradition of country music as exemplified by the likes of Buck Owens and Merle Haggard and latterly Dwight Yoakam, a tough guitar driven sound. In this tradition Langston and his band The Supermodels are a crack outfit with fine guitar and vocals that hiccup with the best of them and for this reason alone the disc is well worth listening to. With songs about mixing liquor and painkillers (“Shiner Bock and Vicodin) and an extended bender following a break up (30 Days) Langston shows that he can write heartbreak songs in the best tradition of his forebears. “Just Pretend You Love Me Tonight” is a stand out here, a song that utilises clichés about true love over a swooning pedal steel that tugs at the heartstrings and could easily become a country staple in the right hands. Although such songs are firmly ensconced in familiar territory there is a sly humour which runs throughout the album (and perhaps explains the band’s name) as Langston states that he wanted “to make an album steeped in its country roots but with a sound and lyrical content that’s equal parts irreverence and homage.” Played loud and (preferably liquored up) it’s a swell listen. Check his page here.